Flex your favorite DC Comic characters! The Batman: The New Batman Adventures Girls Night Out Bendable Action Figure Boxed Set is based on a crossover episode of The New Batman Adventures titled "Girl's Night Out" with guest appearances by Supergirl and Livewire from Superman: The Animated Series. 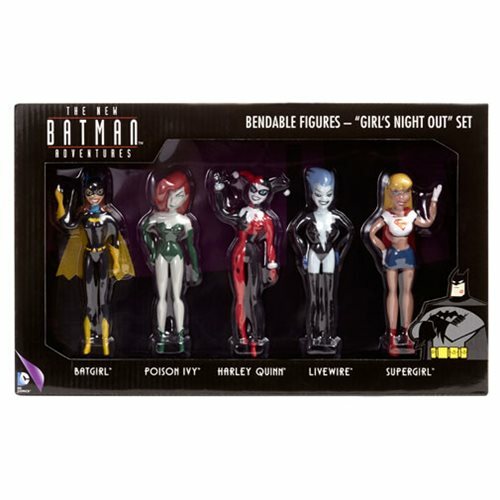 The Batman: The New Batman Adventures Girls Night Out Bendable Action Figure Boxed Set includes Batgirl, Poison Ivy, Harley Quinn, Livewire, and Supergirl. Each figure measures approximately 5-inches tall. Ages 3 and up.